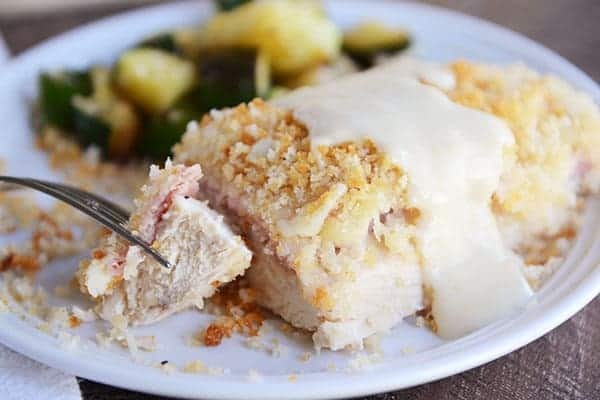 There’s no reason to fuss over finicky chicken cordon bleu recipes when this easy chicken cordon bleu, casserole-style, is simple and just as delicious! I hope you are one of the 100+ people who have made and loved this easy chicken cordon bleu recipe over the years. Considering it is still a very strong dinner staple in my house, I wanted to give it a moment in the spotlight. I updated pictures and added extra recipe notes. Basically, I want to give you a little encouragement to just make it already, and I think you’ll be happy about that. Don’t get me wrong, I love classic chicken cordon bleu in all its gloriousness. I really do. But sometimes I want an easier way with less work and all the same delicious flavor and taste. Enter chicken cordon bleu the easy way. Or the lazy way. Or the slacker way. I’m good with any or all of those titles. When easy is this delicious, you don’t care about those kinds of things. Simply put, you take boneless, skinless chicken breasts and cut them in half lengthwise to make two thinner chicken breast cutlets. You can also just use thin pieces of chicken or pound the chicken thin; I’m telling you, this recipe is not fussy. 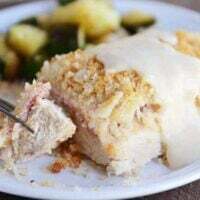 The chicken is topped with ham, swiss cheese and bread crumbs and baked to golden, bubbly perfection. 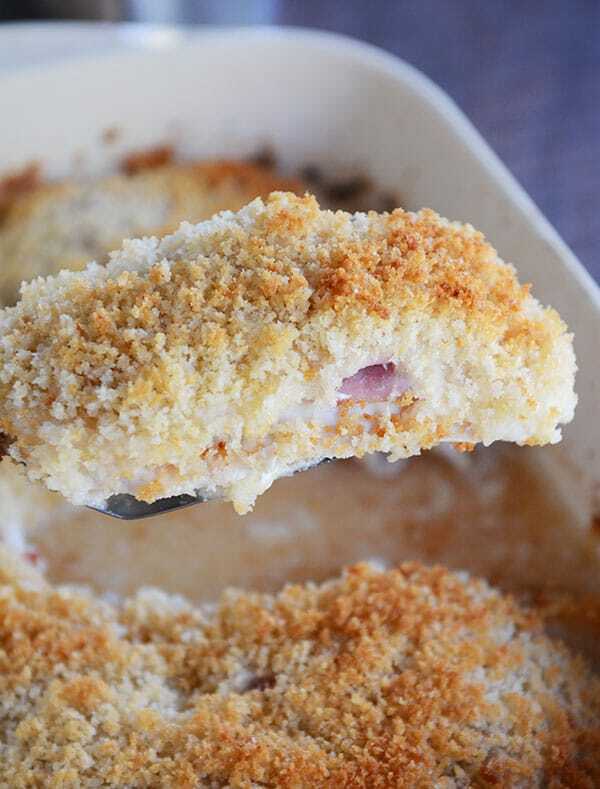 Served with a super simple creamy Parmesan-Dijon sauce, this easier chicken cordon bleu is just as satisfying as the original. And you don’t have to mess with all the fuss of pounding, rolling and toothpicking. My kids go nuts over this meal, and it is often a Sunday dinner staple since it can be made ahead of time. I’ve included make-ahead details below the recipe. I’ve even included a little note in the recipe about how I make this even more family-friendly by cubing the chicken and making it a bit more casserole-style. Perfect for those kids that are too little (or too busy) to eat a whole chicken piece themselves. So yeah, maybe this version isn’t quite as pretty as good ol’ classic chicken cordon bleu, but when your hungry husband and five kids are devouring dinner like they haven’t eaten in a year, pretty is the last thing they have on their minds. There’s a time and place for everything. 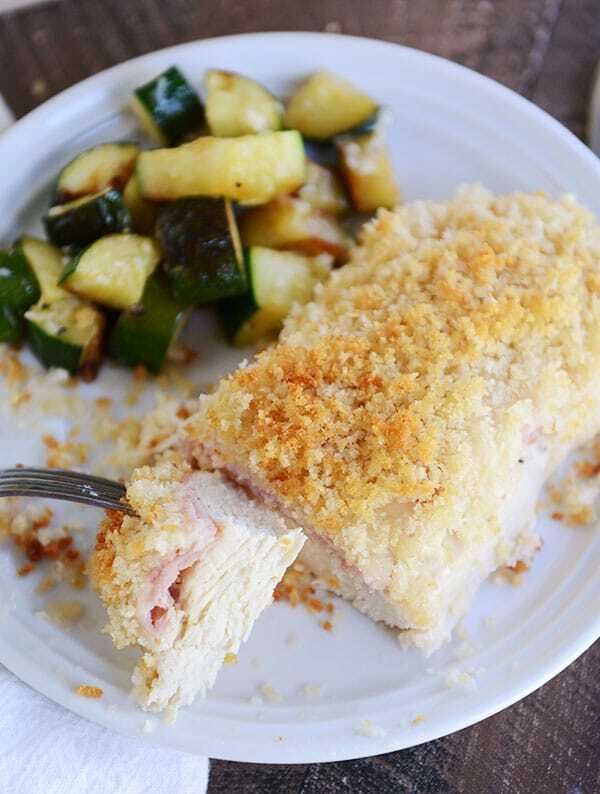 Right now, this easy chicken cordon bleu fits very nicely into our style of weeknight dinnering. Preheat the oven to 350 degrees F. Lightly grease a 9X13-inch baking dish with cooking spray set aside. Lay the cut chicken breasts in a single layer in the 9X13-inch dish. Lightly sprinkle both sides with salt and pepper. Layer each chicken breast with two slices of ham and top with 2 slices of swiss cheese, shingling across the chicken breast to make sure the entire piece of chicken is covered with ham and cheese. Toss the bread crumbs with the melted butter and sprinkle the mixture over the top of the chicken. For the sauce, while the chicken bakes, in a medium saucepan, melt the 2 tablespoons butter. Stir in the flour, and cook for 1-2 minutes. Slowly pour in the milk while whisking quickly to avoid lumps. Stir in the chicken bouillon granules. Whisk constantly over medium heat until the mixture begins to simmer and thicken, about 3-5 minutes. Once the sauce has bubbled and thickened, remove from heat and stir in the mustard, Worcestershire sauce and Parmesan cheese. Stir until the cheese is melted. Keep the sauce warm until the chicken is finished baking. Season to taste with salt and pepper, if needed. My preference for bread crumbs in this recipe are fresh bread crumbs (I save the heels of my bread stashed in the freezer for just a recipe like this when I need to grind up fresh bread crumbs quickly in my blender or food processor) or crunchy Panko breadcrumbs. Both will give the best texture. For the chicken, the idea is to have six thinner cutlets of chicken (about 1/2-inch thick) so you can either pound chicken breasts thin or cut thick chicken breasts in half to form two thinner cutlets (like the recipe suggests). I've also made this more casserole-style and cubed the chicken. When I do it that way, I also chop the ham but do everything else the same. It helps the meal stretch further, especially with kids who are too little to eat a whole chicken breast piece. Over the years since this recipe has been posted, I've made note of your comments; I've omitted the salt from the sauce recipe and indicated in the recipe to add salt and pepper to taste, if needed. Make Ahead Instructions: Assemble the chicken, ham and cheese according to the recipe. Store the prepared bread crumb/butter mixture in a resealable plastic bag or other container. Cover the casserole with plastic wrap and store it and the bread crumb mixture in the refrigerator for 8-12 hours. When ready to bake, sprinkle the bread crumbs over the top and bake according to the recipe, adding anywhere from 5-15 extra minutes since it was refrigerated prior to baking. Make the sauce while the casserole bakes or make it ahead of time, let it cool, and store it covered in the refrigerator for 1-2 days, reheating over low heat and whisking to recombine before serving. Recipe originally posted June 2011; commentary, pictures, and recipe notes updated September 2016. I tried to find the carb count for a friend. Do you know what the carb count is for the recipe as printed? My son is type 1 diabetic so I figure carb counts for everything we eat. I’m planning on making this for dinner tonight and have figured the carbs for one chicken breast and one tbsp of the sauce is 15 carbohydrates. Hope that helps! Mel – I am considering making this for a take in meal. Does the sauce travel and reheat well? I made the same family a take in meal last week and make your Chicken Shawarma, with yellow rice and vegetables and a giant chocolate chip cookie – everything was a hit! They are tired of pasta/mexican, so I thought this might be a good change. Thank you for your help! Thank you for the information and quick reply! I will definitely be making this for them this weekend! Every time I make this there is an awful lot of water on the bottom, how can I make it with no eater being on the bottom and making it soggy? Some will depend on the type/brand of chicken you use. I’ve found certain brands definitely give off more water while baking. Having said that, I always have a little water after baking too so I try to serve it as quickly as possible. Amazing! So simple yet so delicious! My families favorite! I have made this recipe several times. Always a hit! Tonight I did not have time to make the sauce so I put honey mustard dressing on the chicken breasts before placing the ham and cheese. My family devoured it!! Wanted to share this variation. I make this recipe so much I have it memorized–my husband and kids go crazy over it every.single.time! It is so delicious! I just have to say I’ve been making this for years. Sometimes as a casserole with precooked chicken and sometimes as individual chicken breasts that are raw. The key is, as my family calls it, the parm-dijon sauce. I could put it over almost anything and they’d eat it. I’m not really a recipe follower, so I do my own thing with the actual chicken cordon bleu, (like I don’t always take the time to slice in half, or sometimes I brown the chicken up and then bake the rest), but I am always coming back to your site to remember how to make the parm-dijon sauce. Thank you!! Made this tonight, it was delicious and easy. Hi Mel, Going to convert this into a freezer meal and was wondering if you have ever put the sauce on under the panko? Wondering whether to put the sauce on before freezing, keep it in a freezer bag separately or just leave it off altogether. I haven’t tried that, Beth. Sorry! All of my children LOVE this recipe! The call it “sandwich chicken” and it is one of my go-to recipes. I believe I’ve made this at least ten times. We are not a Swiss cheese family so we use provolone. I also like my meals extra hearty, so I usually use the Oscar Meyer carving board ham, or leftover slices from a ham dinner. Try adding a teaspoon of cayenne to the panko crumbs of you like a subtle kick. My husband requested and it came out delicious! Sauce was real tasty and simple to make! Great recipe, my son requested for this birthday. Was delicious and easy to assemble. Hi Mel! I’m planning to make this for a luncheon I’m catering so will be doing the cubed chicken/ham option. I have one probably dumb question — can you tell me approximately how much chicken breast in pounds that you use? Individual chicken breasts vary so much in size I would rather go by weight than number of pieces! For this recipe, it’s probably right around 1 1/2 pounds. Does that mean a total of 1 1/2 lbs or a total of 4 1/2 lbs ( each chicken breast at a pound and a half )? I use a total of 1 1/2 pounds. Made this tonight for my family and they loved it! Another slam dunk from your site! I am the lead cook at a small town diner in SE Nebraska and am planning on making this tomorrow for the special of the day. Can’t wait! This was an excellent recipe. I have made traditional Cordon Blue for my family many times, but the pounding and rolling makes it a chore. This recipe was brilliant. The only thing I did different (so I could say it was my variation) was to coat the chicken with Dijon Mustard and bread it with Panko crumbs before layering on the ham and cheese. I then added the overall coating of Panko crumbs and baked as suggested. This eliminates any residual liquid in the pan if the chicken has too much moisture. I haven’t seen this issue in other comments, but when the chicken was done baking, there was about a half-inch of liquid (from the chicken and ham, I presume) sitting in the bottom of the dish. The finished product tasted good (I drained off the liquid before serving) but it made the breadcrumbs a little mushy around the edges of the chicken. Any thoughts on how to avoid this? If my chicken is overly wet, I’ll often lay it dry really well with paper towels and it helps combat this issue a bit. A lot will depend on the brand of chicken and ham…especially those brands that have a lot of added water or broth injected and added. You can put a cookie cooling rack underneath the chicken. I am horrible at commenting, but I just wanted to let you know that you are my go-to source for delicious and practical recipes. I use your recipes for at least 3 meals a week (if not more) and we haven’t tried a recipe yet that we don’t like! So THANK YOU THANK YOU THANK YOU for all of your hard work and dedication AND AMAZING recipes! It is certainly appreciated! Thank you so much, Jaci! This was YUMMY! The sauce put it over the top. It was a good thing we had to rush dinner last night or I might have gobbled up the rest. Even my kids, who declared “I don’t like Swiss cheese!”, loved it and requested it become a regular meal. Thank you for the yummy recipe! This was so delicious! My husband said it’s the best he’s ever had. We had it with your spinach salad you recommended and mashed potatoes. D Lish! Thank you for this awesome recipe. I love this recipe. I’ve made it many times now. Last night I made the modified version with the cubed ham and chicken. Brilliant. My husband also likes a similar dish that is served on a bed of sautéed spinach. So I put a layer of spinach as the base this time. Baked up perfectly! As always thanks for your delicious recipes. Made it, loved it! So simple, so easy, so delicious! Thank you so much for sharing this! I made this tonight– so good! We only needed half the sauce, so I’ll halve that recipe next time. I also used probably half the amount of ham. Thanks for a great recipe! This is so good.I like to make extra because we usually have it for dinner one night and then make sandwiches out of the leftovers the next day. I just toast some bread heat up the cordon bleu and add tomatoes,red onions and lettuce and more of the awesome sauce. Amazing! This recipe has been one of my go-to favorites for company and for comfort food since you originally posted it! Two thumbs way up for bringing this baby back out into the spotlight!! Sorry I missed your cinnamon roll demo- I’m sure it went great! Facebook Live is so fun! Love you, Mel! I really want to try this recipe…sounds sooo good. My fear is that even after 35 min the chicken won’t be cooked thru. I know it sounds really dumb. Maybe I will still give it a go. Did anyone else have to bake it longer? I think it depends on the thickness of the chicken breast to start out with- and every oven can vary I cooking time. I would give it 35 mins and then just check it, and cook it longer if needed. I would plan or maybe 45 mins the first time around and then you will know for the future how your oven does. It’s been great for me! I think I did go up to 40 or 45 in my old house (but I’ve been known to overcooked chicken out of paranoia more than a few times…). A digital meal thermometer would help! Enjoy! I make this A LOT and have never baked it more than 30 min! As Amy W stated, it will depend on the thickness of your chicken portion. Boneless breast can dry out so quickly when baked…I find that at 25-30 min, it’s cooked through (no pink!) but not dry. Hope you enjoy it! I have made this recipe many times and it never disappoints! We love it! Yum! I’ve never made chicken cordon bleu before, but it’s one of my favorite meals! I’ll have to try this asap! Chicken cordon bleu is one of my husband’s favorite things ever. So excited to try this easier, less-fussy version! Mel, it’s my husband’s birthday tomorrow and he requested that I make chicken cordon blue. I wasn’t looking forward to spending the time making such a time consuming dish but it’s his birthday and I love him so what’s a girl to do? Then today I open my email and find this recipe! It’s like you read my mind. This looks so easy that I can assemble it before hand and have time leftover to enjoy with him. Thank you Mel! I’m so happy to hear this! Happy birthday to your husband! He loved it! Thank you Mel! I think you may have left out a step. You have butter and bread crumbs listed for the cordon bleu, but don’t mention the butter in the instructions. Sounds Yummalicious, though! Thanks, Ann -that somehow got left out with the update. Just fixed the recipe! I am so pleased to see you highlight this particular recipe. I am not exaggerating when I say I make it about 3-4 times a month….a family favorite! I prep the pan of chicken early in the day (so easy!) and quite often drop off an extra prepped pan of two at my parent’s house–also my dad’s favorite. I highly recommend this to everyone! I am assuming that I am supposed to stir the bread crumbs and the melted butter together before sprinkling over the top? Or do you sprinkle the dry bread crumbs and then drizzle with the melted butter? The recipe states to sprinkle the bread crumbs, but doesn’t really mention the butter. Sounds like a great recipe; eager to try it out! Thanks! This was delish – thanks! Great job, Mel, once again! Really tasty recipe. I used Parmiagiano Reggiano which I had on hand, and a little white wine. You’re the best! I have made this chicken several times now, my family loves it! It is so easy and delicious. Like everyone else I omit the salt completely. I think that the problem might be that people are using the kind of grated Parmesan you would put on pizza instead of fresh. You buy it on the shelf instead of the refrigerated aisle. Anyways, I have used both and the fresh that you grate yourself is much tastier and a lot less salty. I also add a little more Dijon to taste. Thanks for the great recipe! I’d like to make one pan of this w/o breadcrumbs so it can be gluten free. Do you think corn starch would work instead of flour in the sauce? Same amount? Jill – I”ve never made the sauce with cornstarch. Cornstarch acts a bit different in sauces since usually you want to mix it with a cold liquid and add it to a hot mixture. Definitely worth a try though – Good luck. I have made this recipe a couple of times and am making it again tonight. My family and I really enjoy it. Tastes great and it’s super easy! I do omit the salt in the sauce recipe (as I found it to be way too salty) and instead sprinkle a little salt on the chicken breasts prior to putting on the ham and cheese. By the way, the sauce is really good and pairs with the chicken well! WOW-I will never go back to the mess and hassle of toothpicks. I changed it up a bit – used panko, and did a layer on the bottom, then the chicken, ham and swiss with more panko/butter mix. I didnt use your parm sauce, but instead just did a light cream sauce with chicken stock. OMG – so so good…and so easy. My mom, who doesnt cook, even asked for the recipe. THANK YOU! When my husband requested Chicken Cordon Bleu, l groaned inwardly. I preally didn’t feel like messing with pounding and rolling, and all the mess. But, he so rarely makes requests that I had to do it. Your recipe was the PERFECT blend of ease and flavor. We all loved it! I didn’t have Swiss, so used Provolone and subbed Ritz crackers for the bread crumbs. Oh, and didn’t add the salt and it was perfect for my salt-loving family. Will definitely make it again. Thank you for another winner! By any chance, do you know how many calories are in this recipe? Jenn – I’m sorry but I don’t. There are several online calorie-type calculators that can probably help you, though, if you google. I made this for Valentines Dinner tonight! It was a huge hit!!! My 2 year old just kept asking for more. I can’t wait to make more of your recipes in the near future!!! Dana – I’ve never frozen this, sorry! But I think it’s definitely worth a try. I’d assemble, cover and freeze and then bake from frozen or let it thaw in the fridge overnight. Thanks for the great recipe! Made it for my familys Christmas today and used ground up French fried onions and ritz type crackers for the crumbs…yummy!everyone liked the sauce too! Will definetly be making this again! I’m going to do this with procuitto and park and put some chopped sage in with the crumbs so it is saltimbocca style. You could get so creative with this recipe. Parmesan? This is the first recipe of yours I’ve tried and I have to say it turned out so well I can’t wait to try more. The chicken was delicious and the sauce was amazeballs! Though I did run into the problem of it being slightly thick, I will just have to make some adjustments in my ratios and maybe the heat level I’m cooking it at. Having such an easy prep and quick cooking time means this can be a weeknight favourite! Making this for dinner tonight (was happy I had all the ingridients) I am so excited, it looks amazing! Quite a hit w adults & children!! And easy! I reduced the amount of mustard and worcestershire in the sauce for kid taste — it was still delicious. It makes quite a lot of sauce– could I freeze it to use for next time? Hi Jane – I’ve frozen this sauce before and it gets a slightly grainy texture after freezing. It’s not bad, just not quite as creamy as when you first make it. at what temperature do you cook the chicken? Hi Kaitlyn – the recipe states to cook it at 350 degrees. Hope that helps! Made this last night with great success! Thanks for another keeper! This is a great recipe for a delicious, yet very simple weeknight meal! I had everything on hand, which is another huge plus! The only thing I did different was omit salt in sauce because I felt it didn’t need it after tasting and used mozzarella cheese instead of Swiss. The baking time was spot on too, which I appreciate. Thanks a lot! Highly recommend this recipe! This looks amazing! I am making it tonight and can not be more excited! This is right up my husbands alley. I was just wondering if you cover the chicken at all through the cooking process or just leave in uncovered the entire time? Thank you so much for all your wonderful recipes! Hi Kristy – I leave the chicken uncovered while baking. I love this recipe! It’s so easy to make and everyone is always really impressed. The only recommendation I would make is for the dressing: don’t add the extra salt until it is almost done. When I made it the parm and the bouillon already had so much salt that adding the extra went overboard! This was absolutely delicious! I didn’t add salt to the sauce and it was still perfect! The dijon sauce really made the meal! Thanks for a delicious meal! I wonder it the saltiness for some is from the chicken bouillon. I bought a big jar of powdered chicken bouillon that was so salty it over powered everything else. I really like the Better than Bouillon paste–so much flavor and not too salty. Joanne – you could freeze the leftover sauce or thin it out a bit (warmed through) and serve it over rice for a pretty simple meal. We made our chicken cordon bleu in the traditional way but were looking for a sauce to complement it. The sauce in this recipe worked perfectly. It thickened up right away, so we quickly added more milk, and yes, chicken stock, to the mix. Worked like a charm. I do have a question though. We have a lot of leftover sauce…what could we use it with? I’m looking forward to trying this, thanks for sharing your recipe! Theresa – there is not a double layer of chicken – the chicken is topped with the ham, cheese and bread crumbs and baked that way. This recipe looks amazing, however, I’m a little confused, please help me out. You are taking three chicken breasts and cutting them in half to make six. That part I get, but when you are topping them with the cheese and ham, are you putting the bread crumbs directly on top of the cheese or topping it with the other half of chicken then putting the bread crumbs? I’m thinking based on your serving size that you are topping the layers of chicken, ham, cheese, then bread crumbs to make a sort of open faced chicken cordon bleu….would that be correct? Awesome! I never have the cream of chicken soup for all of these recipes I see online. I don’t ever need to buy it….this sauce is delicious!!!! Thanks for a great recipe!! Very good, such a nice change from the everyday chicken breasts we’re so used to. Served with fresh broccoli and sauce was a great addition to that also. Yummy and delicious! Will definitely repeat again. I made this last night for a friend who has been ill and WOW! I wanted to dive into the sauce pan and swim around in all it’s creamy goodness. Way better than the doctored up cream of chicken sludge I usually serve with chicken. Thanks for a great recipe. It’s a keeper! I think I might play with the ham cheese and chicken a little but no alteration on the sauce. It was flat out he best sauce I have made. Maybe leave out the salt but wow. Thank you. Had to pin this to Pinterest for later. I made this tonight and everyone thought it was delicious. I had some leftover cheese sauce I will make Chicken Parmesan and use it up. This was fabulous! My whole family loved it, including my toddler! This was excellent. I used pepper jack cheese instead of the traditional Swiss. Loved by all around the table. Is now in the rotation!! So much easier than pounding and stiffing and rolling only to have the cheese melt out! Trying this tonight!! There is not a recipe on here I have tried that my whole family hasnt loved so I am sure it will be a hit!!! We barely eat anything that isnt on your website any more!!! For those of you looking for bouillon substitutions, I used Better Than Bouillon with success! Americas Test Kitchen recipe cuts a pocket in the chicken breast stuffing the ham & cheese inside then breaded in ritz cracker. Why not use heavy cream instead of milk in the sauce? My husband loved this! It was so easy and fast. I laughed when I saw your comment “cream of chicken soup – free sauce”, because I skip over any recipe that calls for it. Thanks for the great recipe! Karen – it’s worth a try. I’ve never made it anyway other than the recipe states so if you don’t have an oven, you can try pan-frying the chicken, covering the skillet and letting it cook through on the stovetop. Hi can i just fry the chicken cordon bleu o just steam it?what if there is no oven availabale? This recipe was the hit of our recent dinner.- Although I am a bit tired of the process at this point since we served 100 people. We actually cut the chicken breast in half lengthwise and in half again since the pieces were so large. It turned out perfect. I doubled the bread crumbs to make them a little more crispy. We were able to fit 8 breasts in one 9×13 pan. As for the sauce, I used fat free milk and did just a pinch of salt, since I figured the ham and the mustard, as well as the cheese would give us enough salt. It was delicious!!! It surprises me that I haven’t commented on this recipe yet because I’ve made it twice now. Another slam dunk! I’ve successfully made the encased chicken cordon bleu only once in my life (using one of your posted recipes, of course), but this will be my go to recipe when ever I want the dish now. The other way is such a hassle!! The sauce is delicious (admittedly my sauce turns out thick too), and such a great compliment to the chicken. Thanks again for another great recipe!! I made this tonight and it is EXCELLENT but I had the same (minor) problems as Tiffany and Michelle Watabe. The sauce thickened up before the three-minute mark and ended up thicker than pancake batter and very sticky. Next time I’ll use more milk and/or not cook it as long. It was also *incredibly* salty which was unfortunate because the flavor was oh. so. good. Next time I’d either leave out the salt or just use a couple shakes. I made this the other night and we loved it! I didn’t have parmesan so I subbed more swiss in the cheese sauce. Turned out wonderful! Thanks Mel! Mel, I hadn’t really been in the mood to cook for a few months and I finally got reinspired from your blog! I am actually excited to make dinner again! I’ve never attempted C.C.B. b/c it seemed way too labor intensive and I also O.D.ed on the store bought kind at the Cannon Center at BYU. I made this tonight and it was delicious!!! I used chicken tenderloins because that’s what I had. I bundled two together and wrapped a large piece of deli ham around it. It worked great. The only thing was, I feared the sauce would be too salty but didn’t follow my gut and wished I had. I ended up adding quite a bit of water to the sauce until the salt was toned down. I agree with a few of the other commenters to let the bullion, worcestershire and parm do their thing without the additional salt. I will be making this for years to come! You have the best food blog around! Hey, Mel! I saw this recipe on Pinterest, but it was a photo from another blog who made your recipe and posted their experience. Glad she linked back to you so I could thank you for the recipe. (I also changed the URL of my Pin so it leads to this post) I have it in the oven now–can’t wait to try it! We are having it with asparagus and roasted baby potatoes. Made this recipe last night and it was delicious! The only change I would make is leave out the additional salt in the sauce. Will be making this again soon! Another winner!!! My husband said he was getting tired of chicken, but that this was really good. Easy and yummy! I made this last night for dinner. When my son found out I was making Chicken Cordon Bleu he asked every 5 minutes if it was done yet. He scarfed up his piece in about 5 seconds. My husband said, and I quote “that was great, make that again.” Overall I would say it was a resounding sucess and will be put into “my favorites” folder. Served with rice pilaf and roasted Brussels sprouts. This recipe ROCKS my world! Thanks so much for posting it! It’s SO easy, and SO delicious! I actually got to thinking that this recipe could be altered in many ways….as in you could pile anything on that chicken, add a little bread crumb, and you’re good to go!! My 14 year old daughter made this for dinner this week. It was delish and I would make it again. Thanks for sharing. This recipe (both recipes, actually) = PERFECTION. Never going to mess with the real cordon bleu, this is now my absolute go-to for this meal. HOORAY, you ‘ve done it again! I made this on Friday night for dinner, and it was great! There was only one small problem – my sauce was not saucy at all! It was really really really thick. I don’t know if I cooked the flour mixture too long, but it seemed to thicken up way before the 3-5 min was up. I even whisked in extra milk at the end to try to loosen it up, but it didn’t help much. The chicken definitely needed the sauce for flavor, in my opinion. But the leftover sauce used the next night was really just bad, but not in a flavor way – just texture! It was a giant glob! Any ideas on how to fix that for next time? Because this was yummy (and SO easy), so there’ll definitely be a next time! Hi Tiffany – not sure why your sauce was so thick! If you make it again, either increase the liquid or decrease the butter/flour ratio, but honestly, I’m kind of bemused why it would have cooked up so thick and so quickly. Mine is definitely on the runnier side of thick when I make it. Mel, I love all your chicken cordon bleu recipes. I’ve tried both the breadbowls and the casserole and love them both. I’m excited to try this one too. I’m sure it won’t let me down. None of your stuff ever does! I have a similar recipe my mom has always made, but we always end up dipping in ranch or something since the recipe has no sauce. We will definitely be adding the sauce to our recipe! Thanks. You really are brilliant. I’m going to try this with chicken tenders–that’s what’s in the freezer. The sauce looks yummy, I will watch the salt amount unless you have chicken granules that are salt free. Love your site–but I think I’ve already mentioned that! mel, you seriously saved us from a night of nasty leftovers or expensive pizza. i always know i can count on your site. this was delicious and SO easy. the sauce was awesome too. i linked this up on facebook. thanks for such awesome recipes! I am new to your website over the last few months and LOVE your recipes! One of my good friends shared it with me and our family is loving the good cooking in our house. I am excited to make this Chicken. It looks easy and delicious. Thank you for what you do! made this tonight! it was soo easy that i was able to throw it together with my 4 little boys in the kitchen with me. i used chicken tenders because that was what i had and they worked great. it was so delicious i don’t think i will make it any other way…unless it’s for company ha ha! thank you so much i love your recipes! Okay, seriously!? I keep thinking I should try chicken cordon blue this way and have yet to do it. It’s so nice to see you were able to pull out and pull off the ideas swirling around in my head! Sweet! I, too save the heels of breads just for breadcrumbs. Makes me feel a bit more frugal and I love that! I tried this tonight for dinner. We all loved it! The only comment I have is that the sauce is saltier than Lot’s wife!! 🙂 I would probably omit the salt, because the boullion and parmesan alone do the trick. At least for me. Thanks for the great recipe! Hi Kim – I cut them in half so they are thinner like a pounded chicken breast (not like a chicken strip). Make sense? I love this stress free, hassle free version of an old favorite! mmm Chicken cordon bleu is my favorite! I cant wait to try this version! Thanks so much. you are a dear! this is the dish my husband requested for fathers day and i was dreading the pounding and rolling. i am going to give this recipe a try. love your site and share it with EVERYONE! I think I’ll have this for dinner tonight! So nice when you already have everything on hand. 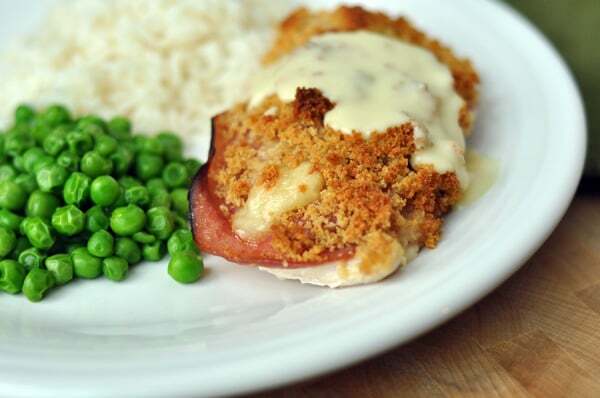 What a delicious and quick version of classic Chicken Cordon bleu Mel. It looks so decadent. The warm Parmesan Dijon Cream Sauce sounds heavenly. Thank you so much for another wonderful recipe. I love your site & the recipe so much. 🙂 Have a great week!